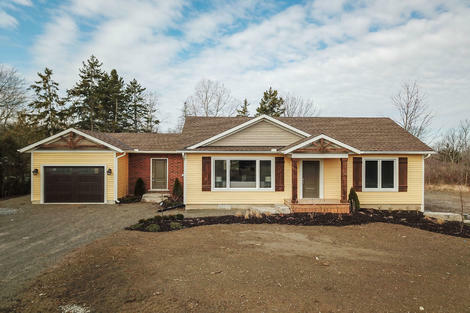 1168 sq ft, 2 BR bungalow was moved to this 0.5 acre property in 2018. Kitchen, bathroom, trim, doors, flooring, siding, windows, trusses, shingles, foundation, electrical, air conditioning, garage, septic & 3000 gallon cistern all brand new in 2018. Eat-in kitchen features pot lights, soft close doors & drawers, garden door to rear 16' x 14' deck. Master bedroom has double closet & ensuite privilege. Lots of windows & natural light. Full, unfinished basement is fully insulated, has great ceiling height, 4 large windows and a roughed-in bathroom. Oversized, single attached garage is drywalled & fully insulated with direct entry to the home. BI DW, MW, fridge & stove stainless steel appliances included. Master Bedroom 19'1" x 10'6"
Living Room 20'11" x 11'2"
Eat In Kitchen 14'5" x 10'7"
Mud room 12'9" x 8'4"